Pioneers in the industry, we offer pharmaceutical measuring cup from India. Size 5ml conical, 10ml round, 10ml taper, 10ml ldpe, 15ml bell type, 15ml glass type. Our firm is involved in offering a wide range of Pharmaceutical Measuring Cup, which is manufactured usingsupreme quality plastic and cutting edge machinery. The products are mainly used for measuring liquid that suits the requirements of the pharmaceutical industry. Moreover, we check the finished products on various parameters, in order to ensure their compliance with industry quality standards and norms. 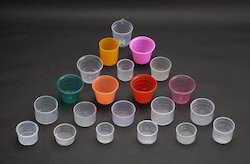 Size: 5ml conical, 10ml round, 10ml taper, 10ml ldpe, 15ml bell type, 15ml glass type. Looking for Pharmaceutical Measuring Cup ?